socialize in this crazy social network for Alter Egos. The game is very simple. You have 200* characters on board, insane and hilarious, some of them explicit. The idea is that all of the players are part of a social network for Alter Egos, where everybody can be whoever they want to be. However, there is a catch - you don't know what your profile image looks like, so when you describe your Alter Ego story it will probably sound crazy and a lot more fun to all other players (because they can see your profile image). When presenting your Alter Ego story be creative, present your "self" in the most fun way you can and tell everybody what kind of person you are looking for. Then all other players will choose a card from their hands and will suggest a match to your Alter Ego story. You will be the one to choose your friend, soulmate, drinking buddy, partner in crime or a date! The main objective of the game is to collect as much winning tokens as you can. The one with most tokens wins the game, because more people have liked his or her Alter Egos. *We have prepared 180 characters, the other 20 will be suggested by our backers. We will choose the best ones and will include them in the game! If no backers submit characters, the game will still be printed with 200 characters (we have designed more than 200 characters). Meet my Alter Egoz was born, when one cold day Jordan was telling Chrissy a story about a game that he used to play, when he was younger with his friends. A game of “blind” and “drunk” poker, where all players place a card in front of their foreheads without seeing it and start betting. This day we knew that we want to create a party game, which will feature this concept. The problem was what type of game to build on this concept where the main card will be hidden from the player. We were browsing some of the social networks when it hit us - why not create a social network for crazy people. Let's face it - many of the people on the social networks are not who they say they are. One can see an image, but the person behind it might be totally insane! This is how all started, the name of the game came almost instantly and we liked it very much. We needed to work on the cards - the most difficult, but also best part! We wanted the game to be funny and easy to play and for us there were two important things – to have crazy, super fun and non-seen-before characters and an easy gameplay that makes people extract even their darkest secrets...or just be creative and tell goofy stories. We started to sketch the bizarre heroes of ours, and we came to problem No.1 - we can not draw in a way that we want our cards to be drawn. 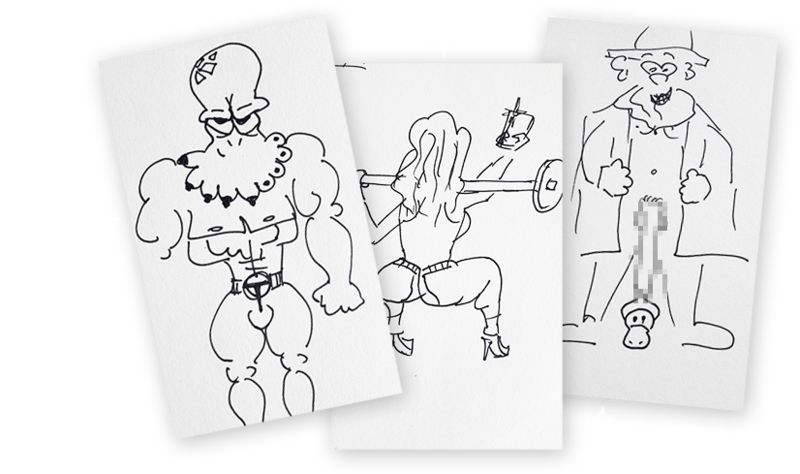 Here you can see our unspeakable and botched attempts to draw an old magician, fitness girl and an unfortunate likeness of a super hero (the super hero is not that bad :D). That's why we had to find people who are way more talented than us. This is how we met Erik and Linda from Tazer Studio. Two amazing people (for sure equally crazy as us), true professionals and great human beings in general. Awesome, right :) Now imagine what the next 180 characters will look like!